If you find that your showerhead is spraying unevenly, and is no longer working correctly, then it may be time to clean it. Over time, the tiny holes in the showerhead become clogged due to mineral deposits, especially if you have hard water. This is why it is imperative to clean the shower head from time to time to keep the water flowing forcefully from the spray nozzle. Learn how to clean a shower head quickly and easily with these simple techniques. It’s imperative that you clean your showerhead because the mineral deposits from water tend to build up over time and clog the holes of the shower head. When you have a clogged shower head, the water isn’t able to flow correctly, leaving you with little water pressure. There are a few ways that you can go about cleaning the shower head using distilled white vinegar, which will remove the mineral deposits and clean your showerhead. When it comes to cleaning a clogged shower head, you can clean it with CLR, a commercial cleaning product designed to remove calcium, lime, and rust stains left by hard water deposits. However, it contains some harsh chemicals that could put you and your family at risk, along with damaging the environment. A less toxic and more environmentally friendly method of cleaning the shower head is with a vinegar cleaning solution. 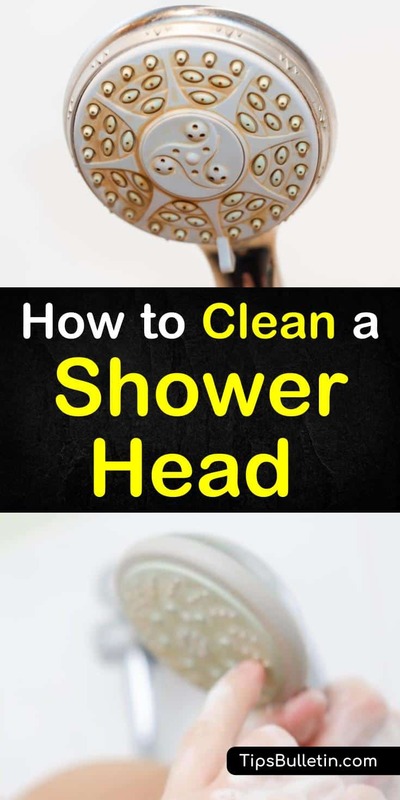 Start by detaching the shower head from the shower. If you’re not sure how to do this, check the instruction manual of the shower for detailed instructions. Many shower heads will twist off the shower arm, but yours might be different. Pour the three cups of white vinegar into the large container. You want to make sure that you use enough vinegar to submerge the shower head completely. Next, pour the baking soda into the bowl. The vinegar solution should start to bubble. Place the shower head into the vinegar bath and leave it to soak for at least an hour. For an even deeper clean, you can leave the showerhead in the vinegar shower cleaner overnight. Rinse the shower head with warm water, allowing the water to flow through the nozzle. Make sure all the excess vinegar is rinsed off, then wipe clean with a soft cloth. Reconnect the shower head to the arm and turn on the shower. Let the water flow through the nozzles for several minutes to get rid of any vinegar that may still be inside the shower head. >> Further Shower Cleaning Tips: Discover how to best unclog and clean a shower drain. If you have a fixed shower head that you can’t remove for cleaning, you can still use vinegar to remove the hard water deposits from the sprayer. To clean a fixed shower nozzle, you’ll need a plastic bag, rubber band, vinegar, and baking soda. Make sure that the plastic bag is free of holes and is one that can support the weight of the vinegar for an extended period. Pour enough vinegar into the bag to completely cover the shower head. Pour about 1/3 cup baking soda for every cup of white vinegar that you pour into the bag. Raise the bag up to the shower head and submerge the shower head completely. Tie off the top of the bag using the rubber band, twist tie, or zip tie, or an elastic band. You want to make sure to secure the bag tightly so that it stays in place when you remove your hands. Allow the bag to stay on the shower head for at least an hour. The longer you leave the showerhead immersed in the vinegar, the cleaner it will get. Remove the bag and run the shower with hot water for several minutes until it no longer smells like vinegar. 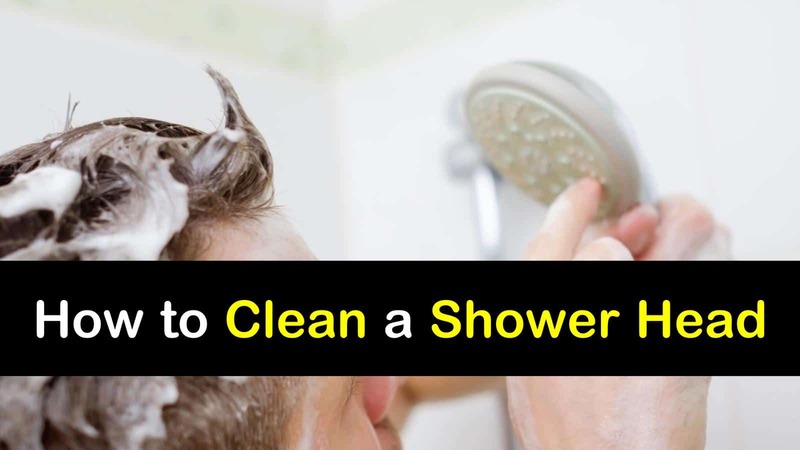 Start by disconnecting the shower head. Dip an old toothbrush or soft cloth in a bowl of white vinegar. Using the toothbrush, scrub the shower head, paying close attention to the small holes that the water flows through. You also want to clean the rest of the showerhead using a clean rag. After you’ve completed cleaning the spray head, rinse the piece in water to remove excess minerals and vinegar. Reconnect the shower head and run water through it to make sure that you’ve reattached it correctly. Another way that you can clear mineral deposits from your showerhead is by cleaning the filter screen. You can locate the filter screen behind the shower head, near the pipe. Start by removing the showerhead from the wall. Next, remove the filter screen. You can usually find this on the part of the shower that connects to the pipe and is relatively small and circular. Use an old toothbrush to scrub the filter screen, making sure all the debris is removed. Run the filter under running water for a few minutes to make sure any excess mineral deposits and debris is removed. Replace the filter screen and put the shower head back onto the shower. Once you’ve thoroughly cleaned your showerhead, you’ll want to continue to maintain it by washing it monthly. You can do this without removing the shower head by spraying it every day with a homemade cleaning solution using vinegar. This daily shower spray can also be used to clean the shower doors, shower walls, and drain to keep mold, mildew, soap scum, and hard water stains away. Combine the water and vinegar in a glass or plastic spray bottle and shake to mix. Spray down the walls and doors of your shower every day after use. No need to rinse the product off as it will evaporate after a time, leaving your shower clean and smelling fresh. If you use this spray for cleaning your bathtub, make sure you let the spray sit for a couple of minutes before you rinse. Keeping your showerhead free form mineral build-up and soap scum is relatively easy. With the right products and a bit of your time, you can remove the build-up and keep the water flowing smoothly. With the right cleaning products, you can get your whole bathroom clean in a matter of a few minutes. We hope you enjoyed learning how to clean a shower head with a few simple products. If you found the information in this article useful, please feel free to share it with all of your friends and family.